Last November, the European Union (EU) struck a deal with the Turkish government that it would stop the movement of refugees in exchange for cash & help in joining the EU. As if more proof were needed for the cynicism & criminality of those regimes who bomb other countries & refuse to accept the consequences; of those who consider human life an obstacle to destroy rather than something to cherish & protect; of those who consider some lives important & most lives of no consequence at all. 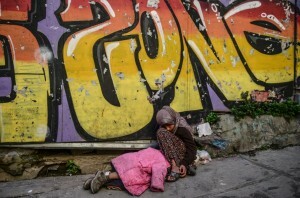 This photo is a young Syrian girl begging in the streets of Istanbul with a tiny child sleeping next to her. It isn’t reported whether they have caretakers or if they’re traveling alone. This is what refugees, especially unaccompanied children, get out of that devil’s pact between the EU & Turkey. We should shudder to think of the dangers they face living on the street in a strange country with a different language because it is beginning to emerge that sexual predation & trafficking are part of EU refugee policy. How else do they explain the Europol report that 10,000 unaccompanied children are missing after being processed by EU officials? Or that they don’t have agents out looking for those children? That devil’s pact will come back at Turkey if they are allowed to join the EU but regrettably it will not impact the officials striking the deal but hit working people, exactly as EU austerity policies are devastating working people in Greece, Spain, Portugal. The hopeful development is the combativeness demonstrated in the past several years by Turkish working people against the regime & by increasing protests around Europe in solidarity with refugees as brothers & sisters. One can disagree with the economics of Karl Marx but never with his international advice that working people of the world unite. Such solidarity is the mightiest force on the planet Earth.